This article is about the skywalk network in Calgary, Alberta, Canada. For the integer value positive 15, see 15 (number). The system was conceived and designed by architect Harold Hanen, who worked for the Calgary Planning Department from 1966 to 1969. This development earned him the 1970 Vincent Massey Award for Merit in Urban Planning. 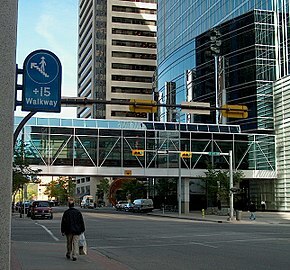 Opening in 1970, the +15 network has expanded to include 59 enclosed bridges connecting dozens of downtown Calgary buildings. The central core of the system is a series of enclosed shopping centres, and the city's flagship department stores. New developments were required to connect to the walkway system; in exchange for this, they were offered more floorspace (the "bonus density"). When not physically able to connect to nearby buildings, developers contribute to the "Plus 15 Fund", managed by the city, used to finance other missing connections. The system has been identified with a decline in street life in the Downtown Commercial Core. 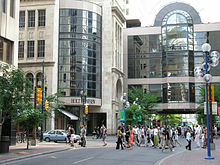 Street life is instead concentrated on streets (such as Stephen Avenue) or in neighbourhoods where there are no bridges (such as Eau Claire and the Beltline). In 1998, the city began to re-evaluate the system. Part of the goal of these studies was reinvigorating decreased daytime street life on some downtown streets. The possibility of limiting expansion to encourage more pedestrian street traffic was raised. The system's bridges are integral to the buildings they serve. City planning by-laws now confer tax credits to owners who connect new buildings to the system. Businesses and the general public make extensive use of the system's enhanced flow of human traffic. The Plus 15 is one of the central plot elements in the 2000 film Waydowntown, directed by Gary Burns.